Now is a great time to grab yourself a beautiful, genuine Japanese kimono, haori or all manner of other Japanese garments and many other things from my www.wafuku.co.uk website because right now there is 15% of everything on the website. …and 15% off absolutely everything else on the wafuku.co.uk, not just the clothing. You can check out my www.wafuku.co.uk website, providing a wonderful range of vintage & antique Japanese kimonos & collectables. Japanese haori are long jackets, with deep, kimono style sleeves, designed to be worn on top of a kimono, though they are fabulous when worn over western world style clothes, like jeans or dresses. Women’s haori can be particularly beautiful, often with fabulous, Japanese textile art on them. They are not worn with an obi, though they do look great when cinched in with a belt or sash. They are usually fastened very loosely with a pair of ties called a himo, which is normally bought separately from the haori. 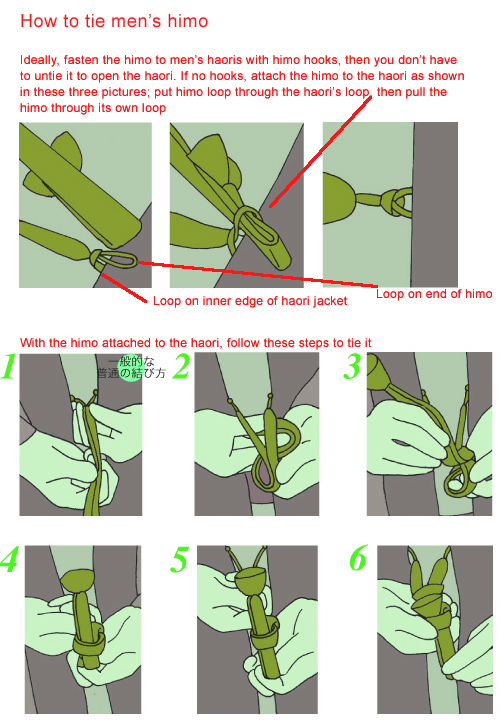 Men’s himo are usually hooked onto the haori and unhooked to open it, rather than untied, though one can just untie the himo instead. Women’s himo are usually looped onto the haori and tied each time it is worn. 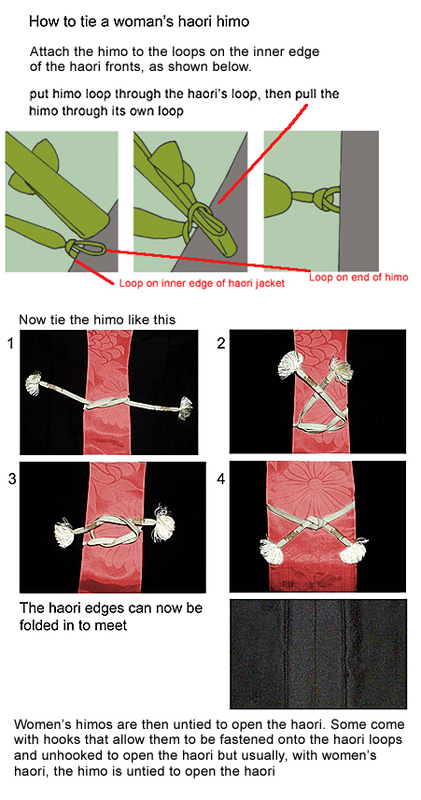 Below you can see some examples of haori and, above those, instructions showing how to tie women’s himo, then how to tie men’s himo, as each gender ties theirs differently. Men’s haori differ from women’s; the sleeves are attached to the body either all the way down the inner edge or all but an inch or so down. This is to match their kimonos. 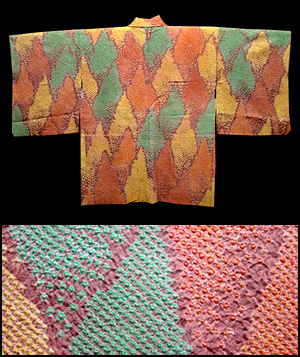 The sleeves of men’s kimonos are the same, whereas women’s kimono and haori sleeves swing loose and unattached at the body edge for a lot of their depth, this is because women wear very deep obis, so the sleeves have to be able to hang over them, whereas men wear much narrower obis and wear them lower down, so their sleeves do not get in the way and can be attached to the body of their garments all the way down. Fabulous scenery, on donsu lining, men’s haori.